The common nettle (Urtica dioica) is one of the most wide-spread spontaneous plant species that grows in all areas where the climate is moderate. The origin of this plant is unknown, but it is spread everywhere on the globe, except for Central and South Africa. 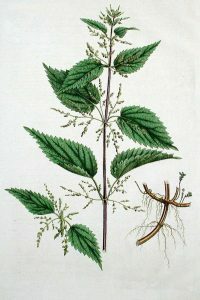 The leaves of the common nettle are very popular in the diets of many people. These are mainly consumed during spring as purees, soups, sides, etc. It doesn’t have a high calorie content, but this plant’s high nutrient content is given by the high amount of mineral salts and vitamins it has. 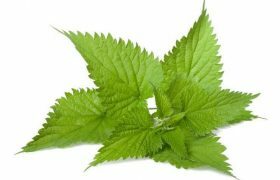 Due to this, the common nettle plant can also be used in the medical, pharmaceutical and cosmetics industries. The common nettle will tread anemia, rheumatism, pancreas, liver diseases, etc. This plant is manly used in the manufacturing of shampoo, deodorants, tooth pastes, creams or aerosols. The common nettle is a perennial plant that grows a cylindric, long and branched rhizome. The stem can grow up to 1-m high. Its leaves are simple, opposite to one another, and they have various shapes with serrated margins. Each plant grows 2 types of flowers. The male flowers are grouped in panicles. The flowers’ color is light green. The blossoming period is between June to October. This plant loves light. It is recommended to plant it on highly illuminated parcels. The common nettle also needs high water quantities, but it doesn’t like excess humidity. The plant will not grow on soils which are affected by droughts. The soils must be rich in hummus and the groundwater must be located at a depth of over 1.5-2-m.
As it is widely spread in the spontaneous flora, creating species adapted to an intensive crop system has been a challenge. Many research stations have conducted studies which have pointed out that the most efficient method of starting a common nettle crop is by planting seedlings which have been taken from the mother-plantation (either spontaneous or planted). Once the soil has been cleaned from the predecessor crop, it needs to be fertilized using 20-40 tons of organic compost per hectare and 250 kg of superphosphate per hectare. The following step would be to plough the soil at a 25-30-cm depth. Mincing the soil needs to be done when planting (autumn or spring). The soil must be modelled into 94-cm wide layers. If the parcel has been severely infected by weeds, it can have herbicides applied 5-7 prior to planting the common nettle. The following products can be used: Roundup or Taifun. The seedlings can be procured either from the mother plantation (spontaneous or planted). The plants need to be mowed at a 5-cm height and all vegetal residues must be removed from the plantation. The following step would be to remove the seedlings from the soil and split them. The roots must be cleaned so that the rhizomes are 3-4-cm long. The seedlings must have 3-4 sprouts. Before planting, the seedlings will have to be mulched. The mulching mixture is a combination of water, soil and organic compost. This mixture must be similar in consistency with sour cream and it must coat the roots of the seedlings. The proper planting period is during the spring or autumn season. The seedlings will have to be planted 1-cm deeper than the mother plantation. The following planting scheme is recommended: 8-10-cm distance between the rows and 5-8-cm distance between the plants on each row. The common nettle crop can also be started using seeds. The same planting scheme should be followed and the needed seed quantity for planting would be 4 or 6 kg per hectare. 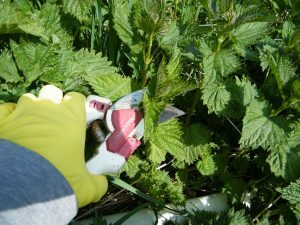 The common nettle is a perennial crop that can be exploited for 3-4 years and that needs many maintenance procedures. During the first crop year, the gaps from the plantation must be filled in. This procedure will help keep the needed crop density. The crop needs to be fertilized after each harvesting as this will stimulate the leaf growth. The fertilizers that can be used are complex NPK fertilizers or nitrogen-based fertilizers. Once the leaves have grown, leaf fertilizers can be applied. The following products can be used: Cropmax, Terra-Sorb, BlackJak, Amalgerol, Razormin. The weed prevention phase can be done either manually or mechanically. The crop needs to be ploughed as many times as needed. Irrigating the crop is also mandatory and it needs to be done as many times as possible. Use around 200-250 cubic meters of water per hectare. The soil can be mulched in order to maintain the soil humidity and to prevent the weed emergence. To carry out this procedure use polyethylene foil, hay, unfermented organic compost, or other proper materials. The mulching layer will also help as underneath it a climate favorable for the development for the micro-organisms will be created. The common nettle is not sensitive to diseases and pests, it is rarely affected by these attacks and even if it is, it will not cause major damages. The common nettle crop needs to be harvested 2-3 times per year. The process needs to be done once the plants are 10-15-cm high. The leaves can be cut or ripped. If the crop is planted on large surfaces, the harvesting process can also be done mechanically. After harvesting, the common nettle leaves must not be in contact with sunlight as it will quickly depreciate. These can be stored for a short period of time inside warehouses that maintain low temperatures. If you want to enjoy the fresh taste of the common nettle leaves for a longer period of time, you can also store the leaves in the freezer.